Temporary plates are used on vehicles purchased in Italy for export or temporarily imported. 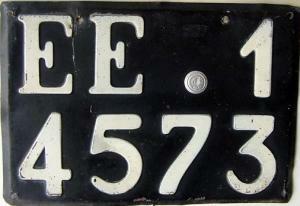 Until 1923: up to 1923 a special plate was given to all foreign vehicles that came in Italy. It was made of cardboard and was oval-shaped, with the name of the customs of entrance and a serial number. It lasted 6 months and was placed over the normal foreign plate of the vehicle. After the sixth months the vehicle had to be registered and take a normal Italian plate. I haven't got any picture of these plates yet, but you can find a photo of a similar situation in the old photo gallery (picture 19). 1923-1929: from 1923 to 1929 there wasn't any kind of special temporary plates and all the foreign vehicles in Italy had to apply for and get a normal Italian license plate. 1929-1974: temporary plates isued between 1929 and 1974 had white characters on black background and had the letters EE, that stand for "Escursionisti Esteri" followed by a number (pictures 1 and 2). The number was serial, starting from 1, and plates were given to the provinces in batches (at the beginning the batches were made of 100 plates and given in alphabetical order, so Ancona got plates from EE 1 to EE 100 up to Venezia that had plates from EE 1201 to EE 1300; later the batches were given when requested and they were often larger). According to the year, the plates had a dfferent official seal (the symbol of fascio until 1944 and then the symbol of the Italian Republic). Moreover, in 1959 a metal white/red tab placed between the seal of the Italian republic and the first digit was introduced to show the expiration of the plate: even if it was obligatory, this metal tab was seldom used, while a red sticker with the same purpose was much more common. In 1963 temporary plates started being made of plastic, but didn't change their numbering system or their look. Front plates (pictures number 3, 4 and 5) were smaller with the EE letters on the right, exactly like normal Italian front plates where the origin code is on the right, and hadn't got any tab. From 1929 to 1959 temporary plates were already very similar, but didn't have the red tab (it was introduced in 1959) and had a different official seal, according to the time of issue. 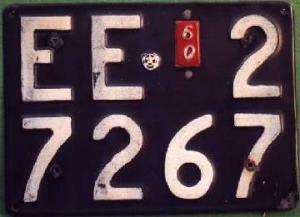 1974-1982: the kind of plate shown in the picture number 6 was used between 1974 and 1982. As you can see there is still room for the sticker of the year (it's slightly embossed under the seal of the Italian republic), but I have no proof that it was in fact used. The only difference from previous plates was that the letters EE were placed vertically and the plate had just one line; front plates didn't change. 1982-Today: the plate shown in picture number 7 was introduced in 1982 (even if they started being issued in 1985) and it's still in use. EE on the left still stands for "Escursionisti Esteri" and then 000 AA is a serial combination. Close to the top side, from left to right, you can see the seal of the Italian Republic, two white/red stickers that show the month and year of expiration of the plate, and the "I" in an oval. Front and back plates are perfectly the same, also in size. Plates are still distributed to the provinces in batches, so it could be possible to understand the origin of the plate from the last two letters (for example Milan AF, AG, AZ, BA, BJ... and Rome AM-AR, AV, BF...). Temporary plates for motorbikes were introduced in 1959: you can find a picture of them in the page of temporary plates for motorbikes. 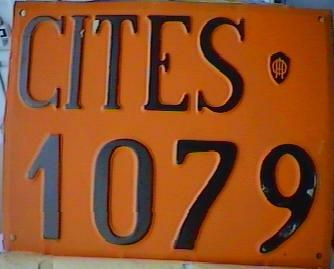 CITES (CIrcolazione Temporanea Enti Stranieri: it means "temporary registration for foreign bodies") plates had a similar purpose of temporary plates, but were reserved for international bodies that worked in Italy after the Second World War. They were black on orange (picture number 8), but were not used too much and disappeared by the 1950s. On some sources I found that CITES stands for "Circolazione Internazionale Temporanea Enti Stranieri", but I'm not sure about it. I need to thank Andrew Pang for the first picture, Alessandro Libanore for the pictures number 2, 4 and 5, Marcello Taverna for the picture number 6, Carlo Bellini for the last and Guglielmo Evangelista for his useful notes. The picture number 3 is taken from the issue of February 2003 of the ALPCA Register by ALPCA.